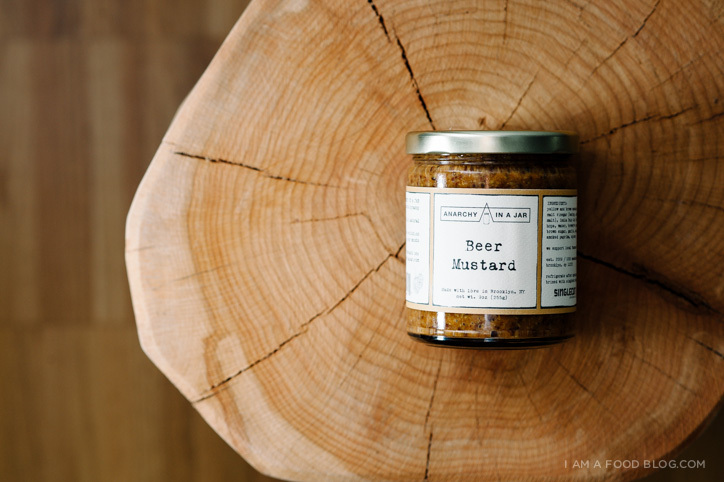 I’m addicted to mustard so when Mouth.com asked me to collaborate with them for a recipe featuring one of their many indie food products I jumped at the chance. Ultimately, I chose beer mustard. Because, BEER MUSTARD! It isn’t officially Oktoberfest yet, but the last couple of years I’ve blinked and missed the whole thing so this year I decided to climb on the wagon early. Who wouldn’t want to jump on the wagon when it’s full of these insanely addictive sandwiches?! Fall is all about comfort food that warms you up from the inside out and these sandwiches are no exception. When I think of Oktoberfest I think of girls in cute dirndl, giant steins of beer, and sausages: in other words, all good things. Unfortunately you pretty much have to go to Germany to get the true experience. I’ve tried here, but I have a sneaking suspicion that it’s just not the same. A few years ago, a couple of friends and I went to a random German alehouse hoping to get in on some Oktoberfest action and the result was not quite as expected. There weren’t any girls and the steins weren’t nearly as large as we were led to believe. It was sad faces all around. We did manage to have some delicious apple cake though! This year, to avoid disappointment, we’re going to stock up on some weisse bier and grill up a bunch of these sandwiches instead. I tried to think about all the things I love about German food and came up with: wurst, pretzels, potatoes, and mustard. 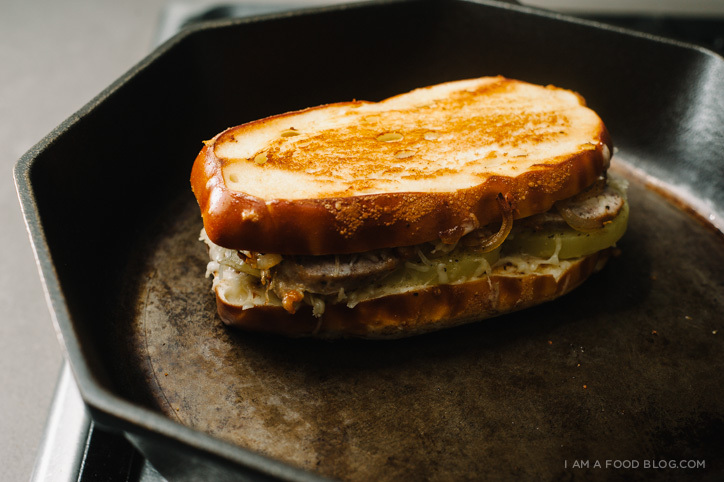 And so, the pretzel-bread, beer mustard, bratwurst, caramelized onions and gruyère grilled cheese was born. I’ve got to say, pretzel bread is my new favourite bread to grill. It’s a wee bit malty, a little bit salty and when you grill it, the contrast between the buttery crunch and the soft pretzel-y insides is so, so good. 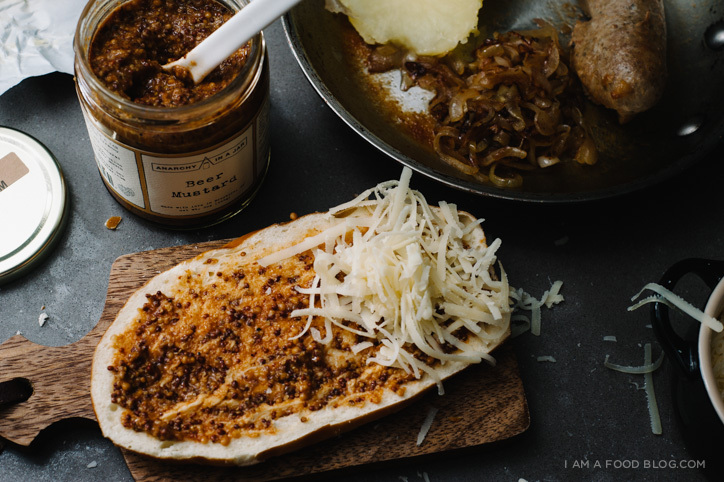 Lately I’ve been grilling it up and eating it slathered with beer mustard – pretzels and mustard are the new PB&J in my books! 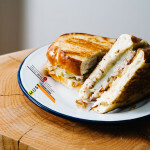 This post sponsored by Mouth.com, the leading online store for indie food, wine + spirits and tasty gifts. They have a ton of great products – and most of them are handmade and small batch. I have my eye on so many tasty things! Mouth.com is offering a discount to I am a Food Blog readers for the month of September so hop on over and check them out! Use IAMFOOD20 when checking out and get 20% off your entire order on all indie food, tasty gifts, spirits + wine, and monthly subscription clubs. In a heavy bottomed skillet, heat up a small amount of oil over medium heat. Add the sliced onions and cook until soft and caramelized, stirring every so often, about 20 minutes. Remove from the heat and set aside. In the same skillet, cook the bratwurst. Add 1/4 – 1/2 inch of water, cover and bring to a gentle simmer over medium heat. When the water has evaporated, the brat should be cooked through. This is unnecessary, but if you like a bit of color on your brat, grill over medium-high, flipping, until slightly browned. Remove from the pan and let rest for 5 minutes before slicing into pieces that will fit inside your bread. Arrange your sandwich. Butter the outsides of the pretzel bread and lay them on a cutting board. The butter should be facing out. Add beer mustard to taste and then layer in the following order: cheese, potato slices, cheese, bratwurst slices, cheese, caramelized onions, freshly ground pepper, pretzel bread (butter facing out). 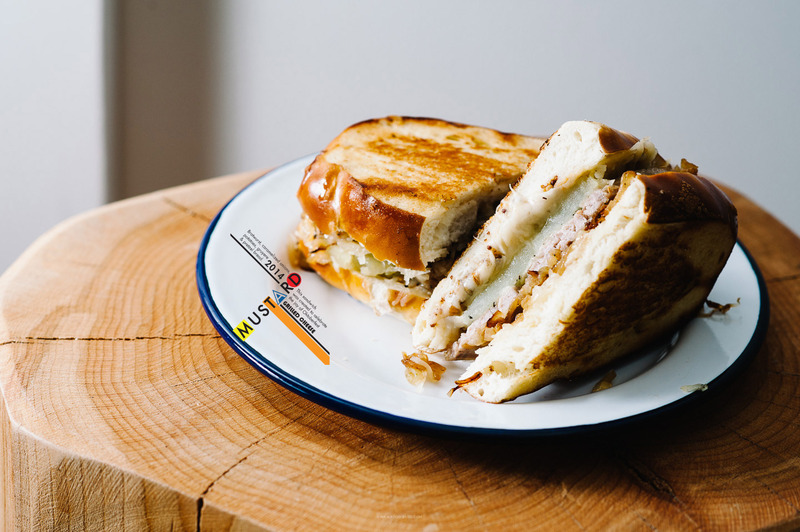 Heat up a non-stick or cast iron pan over medium heat and carefully move the sandwich to the pan. Fry until the cheese melts and the pretzel bread is golden brown and crispy, flipping once. Enjoy immediately. Put. This. In. My. Mouth. Aww man, this looks so delicious! 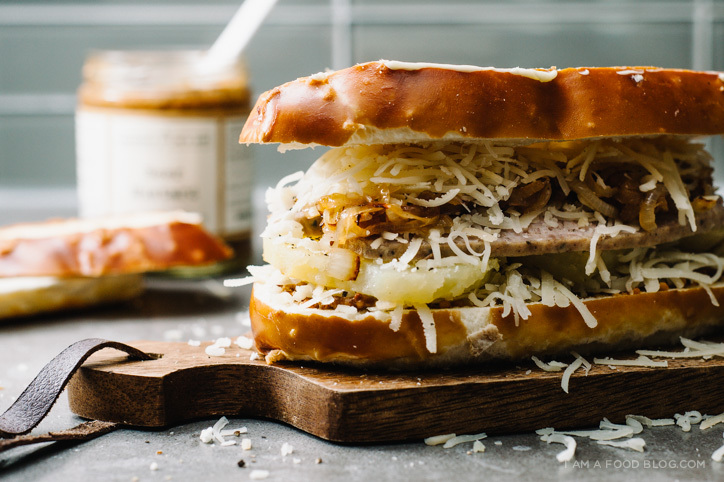 I’m never really aware of Oktoberfest since no one celebrates it here but as a mini celebration, I might do some themed recipes: any excuse to eat like this! Dude, this is like, all my favorite things at once. Seriously. The grilled onions on this..YES. I always love the little graphics you add to your photos!! So cute and always graphically interesting and on point :) AND ALSO THAT SANDWICH. SO on point! I was in Germany a few years ago, in Bavaria (the province where Oktoberfest is held) and even though it was June, people were wearing the little leiderhosen, drinking steins of beer, eating sausages, and giant pretzels. I may have missed the actual event of Oktoberfest but… not really. I have a crap ton of brats in the freezer from COSTCO by a local producer. So many that we are sick of them. Now. Now I have a new recipe to renew my interest in those brats! OH MY. i need this i want this!! This looks too good! I’m sure the pretzel bread makes all the difference! This is an out of sight sandwich. It’s says October fest all over it. I love grilled sandwiches and make them often. Girl, my Bavarian heart just skips a beat. This looks insane! And that mustard – heavenly. Actually, I’m going to jump on a plane next week, put on my dirndl, and raise a Maß or two of good old beer! Prost (=cheers)! Thanks for the Mouth.com code – I’m definitely going to be making some purchases! These sandwiches look incredible. We are lucky enough to have a few good Oktoberfest spots here in the city. I’ll have to go get a giant stein soon. This looks so good. I shall definitely be making this as a treat at the weekend! 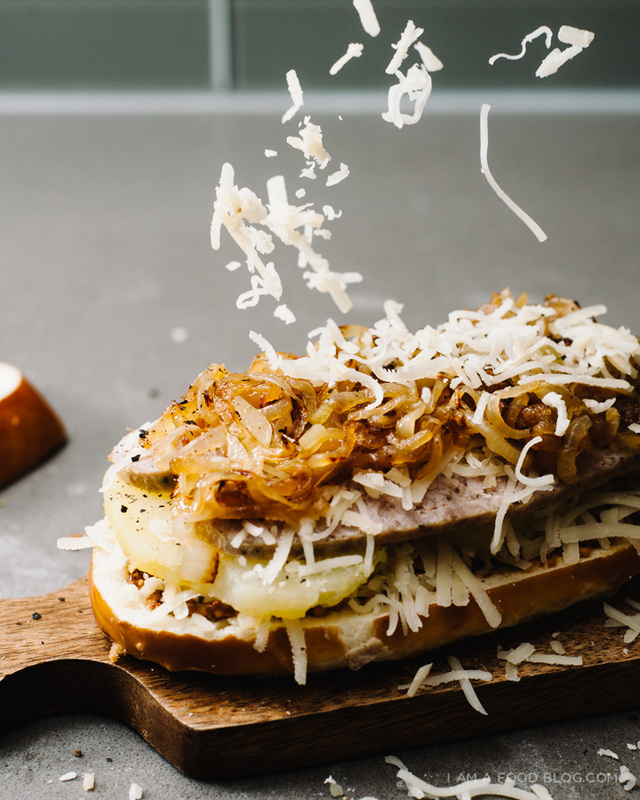 It looks so good, we may just end up putting this Bratwurst Grilled Cheese on our menu.